My writing activities were fairly closeted in the past so I did not feel the need to be involved in any sort of writing community. It was only after finding out about and joining NaNoWriMo a few months ago that I finally cared to participate. A pantser is a writer who writes their story “by the seat of their pants,” so the saying goes. Pantsers do not outline or do any sort of intensive preparation. Most pantsers seem to start with a concept they are interested in writing about and go with that. Some may start with the characters themselves and introduce them to scenarios to see what they do. Some may simply start with a cool sounding title and build a story around that. It’s a “let’s see what happens” kind of attitude. Stephen King is an example of a famous pantser. In his book On Writing, he tells us that he doesn’t outline. I was genuinely surprised to learn this. As the name indicates, a plotter is a writer that plots out their story before the actual story writing. 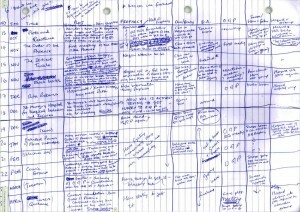 The level of plotting and planning can range from an outline to complicated mind maps and world building. An example of a famous plotter is J.K. Rowling. She didn’t come out and say it like Stephen King did, but she demonstrates it quite clearly with the various tables and diagrams she released publicly. 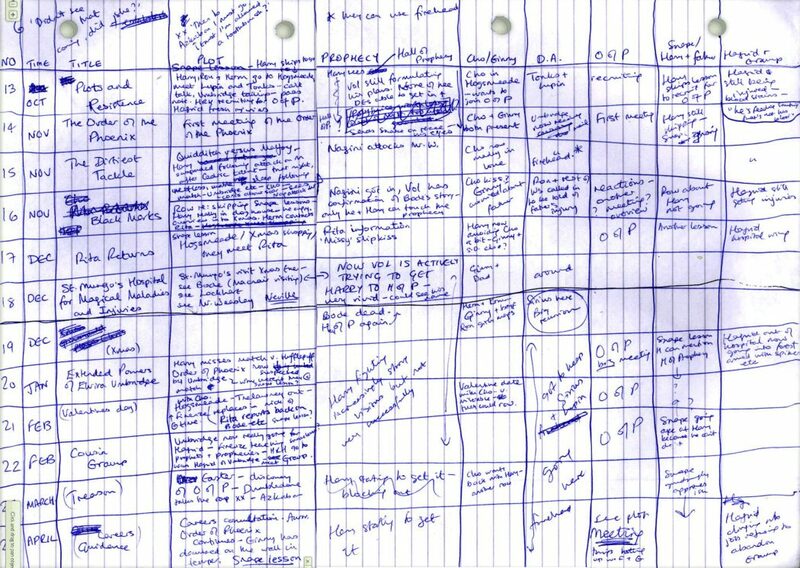 There have been blog posts that deconstructs how J. K. Rowling plots and plans with the table below. I am most certainly a plotter. I had no clue there were such people as pantsers. I always thought plotting was how it was done and never considered pantsing any of my stories, ever. Now, I’m not saying plotting is superior to pantsing or vice versa and I am not interested in debating about it (apparently, this is a sticky subject for some people). If you are a pantser and that is how you write, then good for you. For me, plotting is my thing and I doubt I can pull off pantsing an acceptable story. I’ve always been a planner. I write lists for everything. I like math, I like programming, I like efficiency, and I dislike uncertainty. I probably sound terribly dull to a pantser, but that’s fine by me. I view pantsing as an emotional way of writing (not that it’s a bad thing! ), because it deals with people and their personalities. I see many pantsers’ story built around their characters. Plotting is more of a logical (I am thinking “if, else” statements here) way of writing. A plotter’s story is about events first with characters written in, or at least that’s how I do it. My plotting starts with a bit of world building. Depending on the story, I can base it off a familiar world (e.g. medieval England, ancient Rome) or develop a 50+ page wiki that documents religion, geography, the magic system, and languages. The starting point is knowing what the place, people, culture looks like. With the situations and plot developments that I want to have happen, I place my characters in said situations, and then give them a back story to explain why they reacted that way. It’s sort of working backwards (only except it’s not). The novel I’m writing is an epic fantasy and will span a few books (not sure how many yet). Such books seem to average from 90k to 120k words. My bullet point outline (not including the accompanying wiki or other documents) is currently sitting at 5k words and it is still not finished. To be fair, my outlines are quite detailed. When it’s finished, it is a matter of filling in the descriptions and dialogue when I finally sit down to write the story. And since I know everything (or most things) about my story and how it progresses, I’m able to weave certain bits of referencing, clues, foreshadowing, Chekhov’s guns throughout the story as I’m writing it. I find that these discoveries are incredibly satisfying to me as a reader (or watcher.. of shows like Lost), and I want my readers to feel the same way. Every writer is different. Not everyone is a pantser, nor are they all plotters. Between themselves, pantsers have different ways and reasons for constructing their stories, and different plotters have different ways of plotting. The point is to tell a story without regards to how we get there. Just write! So are you a plotter or a pantser? If you’re a pantser, how does it all start? If you’re a plotter, how do you plot? Going to San Juan in October!